People often ask us about the R-value of a Watershed Block, or of a wall built of Watershed Block, or of a rammed earth wall built by our sister company Rammed Earth Works. For many good reasons, the building industry is highly interested in insulation. Reducing heating and cooling costs is paramount in reducing the overall embodied energy of our built environment. However, focusing on insulation alone (R-value) as a mechanism to ensure indoor comfort with lowered heating and cooling costs overlooks another key element of the equation - thermal mass. The relationship between insulation and thermal mass is nuanced. Insulation reduces the movement of heat, while thermal mass has the effect of storing heat. Insulation, while very good at slowing the movement of heat, generally has little to no capacity to store heat. By contrast, thermal mass, while very good at storing heat, generally has a relatively poor ability to slow the movement of heat. Despite these differences, the comfort of indoor environments can be efficiently maintained by employing either insulation or thermal mass, or a combination of both. The thick earth walls of China Fujian Tulou, here shown in the Hekeng cluster, have been providing their inhabitants with cool daytime temperatures and warm nighttime temperatures for hundreds of years. Image credit Fon Zhou, used with permission of Creative Commons Attribution-NonCommercial 2.0 license. These two mechanisms inform two distinctive strategies for maintaining stable indoor temperature and comfort. The first strategy uses thorough insulation and vapor barriers to effectively separate indoor air from outdoor air. A complex heating and air-conditioning system then circulates indoor air. Efficiency is gained through using as little heating and cooling as possible, with the HVAC unit often drawing on the exhaust air to pre-heat (or pre-cool) intake air in a sort of temperature exchange. The second strategy instead relies on a concept of a thermal flywheel to naturally heat or cool thick masonry or earthen walls that store this temperature and naturally regulate indoor air temperature, often with little to no heating or cooling. Exterior walls of homes that embrace modern construction concepts including Passive House and Net Zero often seal off exterior air from interior air with impermeable vapor barriers and high amounts of insulation. Heat exchanging ventilation systems circulate air. Image credit NBT used with permission of Creative Commons Attribution No Derivitives 2.0 license. Each strategy has its merits and downsides. The first strategy relies on complex heating and cooling systems that may not function during power outages or after mechanical failures. Additionally, a fully insulated and vapor sealed building does not “breathe” naturally, raising concerns of air quality. The indoor air quality of sealed buildings is such an issue the California Building Code now requires additional mechanical ventilation to bring in fresh air in all new construction. The second strategy, while relying less on complex heating and cooling systems, relies instead on fluctuations between the nighttime and daytime temperatures, known as diurnal swing. Without these temperature fluctuations, the thermal flywheel mechanism doesn’t function and little energy savings are achieved. With the above as background to the discussion, how do we answer the question when asked to put a number on the R-value of a Watershed Block or a Watershed Block wall, or a rammed earth wall? A Watershed Block, like rammed earth, has a relatively low R-value. That’s the point, after all, of materials with a high thermal mass. A Watershed Block, like a rammed earth wall, has to move heat in order to store heat. Even with a low R-value, a Watershed Block wall, like any earthen wall, can still contribute to maintaining a comfortable indoor air temperature. 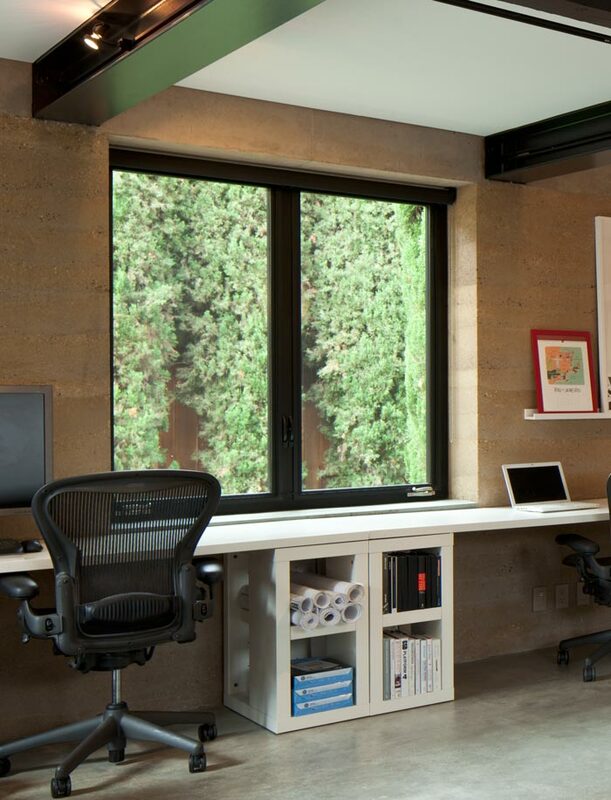 And, a low R-value does not mean that a Watershed Block or rammed earth wall needs to be insulated. Let’s examine the two questions separately - how can a Watershed Block wall, like a rammed earth wall, provide insulative properties while having a low R-value, and, what is the effect of adding insulation to a Watershed Block wall or a rammed earth wall? The first question - how can a Watershed Block wall, or a rammed earth wall, provide insulative properties while having a low R-value - examines the idea of “effective R-value”, otherwise (and more accurately) known as “mass enhanced R-value.” The difference between R-value and “effective R-value” / “mass enhanced R-value” can be understood by examining the difference between the lab environments in which R-value is measured versus the real world environments in which building materials are used. R-value is measured technically in a lab, specifically in a machine called a guarded hot box. One side of a material - whether fiberglass, a Watershed Block, or a sheet of drywall - is maintained at a constant temperature. The other side of the material is kept at a different constant temperature. The amount of energy required to maintain this temperature difference is measured, and an R-value is determined. This specific R-value is a “steady-state” R-value and reflects the material’s ability (or lack thereof) to insulate against two constantly different temperatures. What about the real world in which temperature differences are dynamic, not steady? In much of the United States, the outside air temperature changes greatly over a 24 hour period, a situation referred to as diurnal swing. In the desert environments and Mediterranean climates that dominate the West and Southwest, the temperature outdoors changes greatly during the day, rising above a comfortable indoor temperature in the afternoon then falling far below a comfortable indoor temperature at night. Over a course of 8-12 hours, the temperatures on two sides of an exterior wall can change dramatically. So the steady state R-value determined in a lab is no longer so valuable in determining how the indoor temperature can be best maintained when applied to a dynamically changing outdoor temperature. From this more dynamic and changing environment, the concept of “effective R-value” / “mass enhanced R-value” has emerged and relates to the idea of high mass exterior walls functioning as a thermal flywheel. Warm daytime temperatures and direct sun slowly warm exterior walls but this heat does not reach interior spaces until after the sun has set. The latent daytime heat in the exterior walls warms interior spaces during the evening, at which point the process reverses and the walls slowly begin to expel the daytime heat through the thick exterior walls into the now cooler nighttime air. By morning, the thick exterior walls have cooled again, and the process continues, offsetting the daytime heat to the evening and the evening cool to the daytime. The thick exterior walls of a rammed earth house can provide insulative properties above the measured steady state R-value when used in climates where the daytime and nighttime temperatures swing above and below the desired indoor air temperature, also known as high diurnal swing. In this way, thick earthen exterior walls can have a higher “effective R-value” that is determined by via computer modeling to determine what a similar steady state wall R-value would need to be to offer the same performance. However, key to the concept of “effective R-value” / “mass enhanced R-value” is where and how the material is used. A thick exterior earthen wall will have a higher effective R-value, but only in certain climates where the diurnal temperature swing allows for this thermal flywheel performance. That same wall in a consistently cold climate - one where the exterior temperature is always below a comfortable indoor temperature - will have no effective R-value improvement. So the answer to the first question - how can a Watershed Block wall, like a rammed earth wall, provide insulative properties while having a low R-value - has to do with the environment where the wall is used. In an environment where the diurnal temperature swing allows for a thermal flywheel performance, a thick earthen wall can provide insulative properties, and a higher effective R-value despite having a low measured steady state R-value. However, in an environment without a diurnal temperature swing, a thick earthen wall does not provide significant insulative properties beyond its measured steady state R-value. The second question - what is the effect of adding insulation to a Watershed Block wall or a rammed earth wall - follows much of the above discussion and examines how thick earth walls, either exterior or interior, can be used effectively in climates in which the temperature is consistently above or below a desired indoor temperature. Additionally, new building regulations like California’s Title 24 virtually mandate insulation, regardless of a wall system's thermal storage capacity. So what is the effect of insulating thick exterior earth walls? Again, location and local climate conditions are key to the answer. 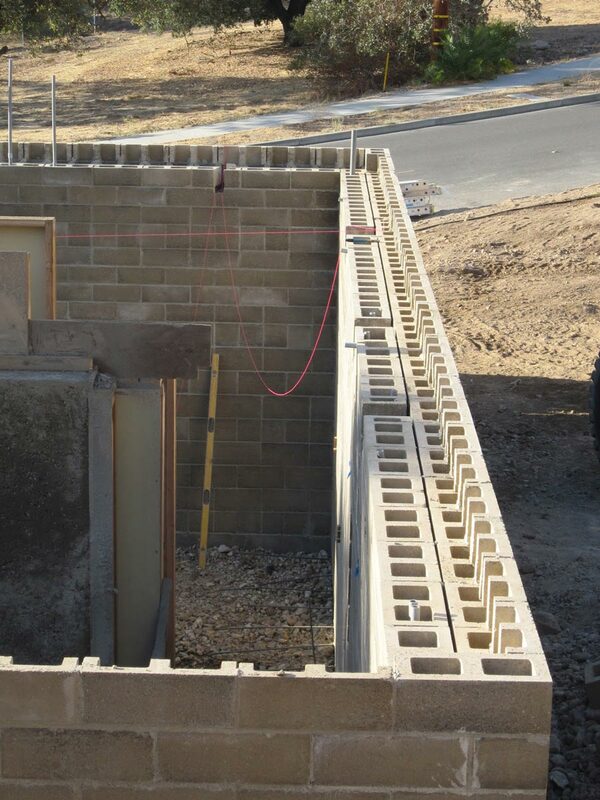 In an ongoing study to determine the most effective use of structure and energy performance, this wall assembly of double block provides one set of hollow cells to receive reinforcing steel and concrete grout to support roof loads and provide earthquake safety, with one set of cells left open to capture dead air space to improve thermal resistance. This wall assembly will have a different thermal response depending on which side of the house it's located. The north side will tend to be much cooler than the south and west because it never sees direct sunlight. In a Mediterranean / desert climate like the American West and Southwest with relatively high diurnal temperature swings, adding insulation to thick exterior earthen walls halts the functionality of the thermal flywheel described above. Warm daytime temperatures cannot reach indoor spaces to warm the interior space at night. And the cool night air cannot expel the home’s heat in the pre-sunrise night. Insulation added to exterior walls will do exactly what insulation does best - stop heat transfer. In climates with long periods of consistent cold or consistent heat, insulation is necessary even in thick exterior earthen walls. However, the mass-effect of using materials with high thermal storage capacity can still provide noticeable benefits to indoor air comfort. High mass earthen walls used inside the insulation envelope will slow indoor temperature swings and regulate indoor humidity. Used outside the insulation envelope, high mass earthen walls can delay intense heating from direct sun by shifting the time that heat reaches the insulation envelope to the evening when cooling systems are more efficient. The effect of adding insulation to a Watershed Block wall or a rammed earth wall is highly debated, especially in environments most appropriate to thermal flywheel heating and cooling. Recent energy code changes in California further amplify the debate. The role of high thermal mass wall structures has not been consistently integrated into concepts of highly insulated net-zero construction. So to answer a question with another question, how are you incorporating insulation with thermal mass, and in what climate?